We work with only the best in the industry, and that's why the MKA-3C uses Outemu's ground breaking modular switches. HotswapTech enables users to change individual switches on-the-fly during operation, giving them instant and endless customization options for their keyboard. Choose from blue, red, brown or black Outemu switches - each with their own different characteristics. Armaggeddon MKA-3C Psychfalcon looks minimalist – with the LEDs off, of course. However, I don’t think that the design is clean. Sure, from afar it doesn’t look like there’s any type of funkily radical design, but if you look at at it at a closer distance, you’ll realize its exposed screws. The entire Armaggeddon MKA-3C Psychfalcon has a Corsair K-series-esque feel to it. It’s plate-mounted and has no case. So, all the key switches are just mounted on a piece of what Armaggeddon claims to be a metal top panel and soldered all the pins on the PCB underneath the metal plate. To be honest, I don’t think it’s metal, because of the hollow sound it makes when I tapped on it. One thing I do like about its design is the caps lock LED being moved to somewhere near the arrow keys. Fits quite perfectly for a TKL keyboard. The other LED though, I have no idea what it does. It just doesn’t turn on, no matter what button I pressed. There’s absolutely nothing to see underneath other than the single-tilt level rubber feet. The Armaggeddon MKA-3C Psychfalcon does not have any sort of cable management routes, and the cable itself is slightly biased to the right side. Armaggeddon found this company of key switches, but it’s called “CONTENT”. I can’t find any sort of product information for this keyswitch at all, so you’ll have to bear with my explanation here. The Armaggeddon MKA-3C Psychfalcon is only available in Blue mechanical switch, according to their product page. They did not mention what switch it uses, so here is what I can tell you all. Armaggeddon MKA-3C Psychfalcon really falls short. 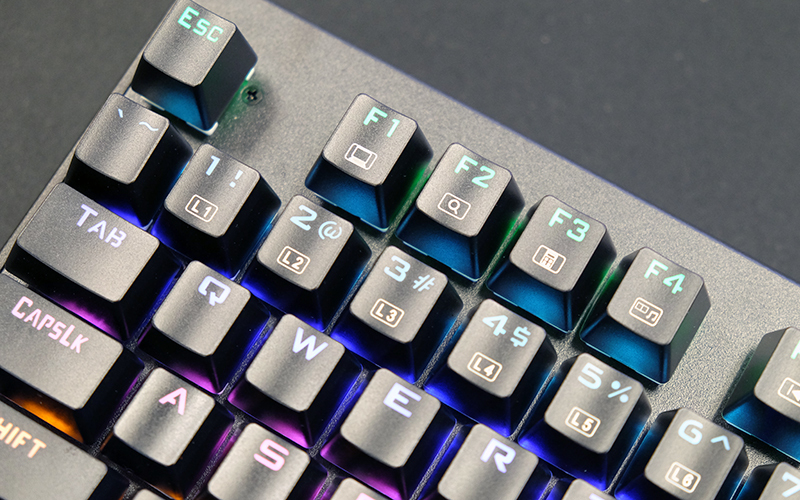 Armaggeddon touts that this keyboard uses their brand new KevlarTech key caps – a “high quality concave keycaps with lifetime fade proof warranty”. I quoted the sentence word by word from their product page, by the way. Other than its texture, the build quality of the Armaggeddon MKA-3C Psychfalcon’s KevlarTech keycap just feels… cheap. It’s a very thin keycap, and we can only tell that thin keycaps generally make a much louder clacking noise when the key is bottomed out. 12 different backlight movement on the user manual is quite exxaggerated. It’s actually just half of that,as it’s split between its different directions. Imagine a the lighting effect is a wave movement from left to right. Toggling the backlight key again changes its direction to right to left, and it’s considered a backlight mode.While that’s technically true, I think the per-row colour backlighting is a turn-off for some users. 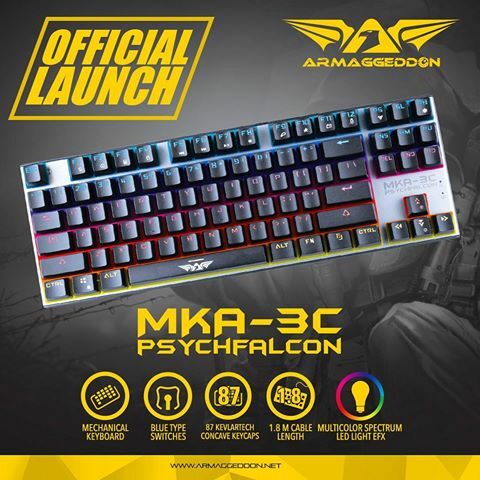 It doesn’t affect me however, as I really don’t like multi-coloured keyboards or mouse – be it RGB or something like the Armaggeddon MKA-3C Psychfalcon. There’s one neat feature though – and that’s the arrow keys emulation by WASD keys by pressing FN+W. For my unit in particular, the other LED beside caps lock should indicate the FN+W status, but it just doesn’t light up.